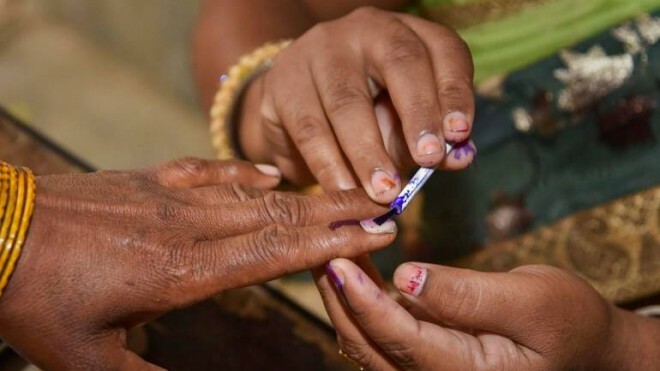 Hyderabad, Apr 12: The elections to 17 Lok Sabha constituencies in Telangana were unanimated as the voters did not attest much in casting their vote, unlike in Andhra, where it was a flinged battle. There were no incidents of violence in any part of the state, except complaints of EVM malfunctioning and missing of names in the voters' list. The voting percentage was only 60.57 per cent till 5 pm and it might go up by another three or four per cent. In rural areas, there was lively polling with Medak recording highest poll percentage of 68.60. But, in urban areas, voters did not evince much interest in casting their votes as usual. In Nizamabad, the polling was very slow and low, as there were 185 candidates in fray. The EC authorities had to arrange 12 EVMs in 'L' shape to accommodate such a big number of candidates in each polling booth.